The dumplings are very tasty. There was plenty of filling in each. The filling tasted well balanced. We got all of the different sauces as well which were fun to try. I thought they all paired well with the different dumplings. I especially liked the chili oil sauce. My girlfriend at the soup which was the side she chose and thought it was good. The food truck worker was nice and gave us each a free sample before buying the dumplings which was what sealed the deal. I love dumplings and would definitely get them again from here! Traversed the heat to procure delicious dumplings. Had second thoughts upon approaching the truck, whose immediate area was barren of patronage. Truck op offered a sample with the Soy Chili sauce. Delish. Ordered a set of 10: regretted not getting more. Will eat again. Only thing keeping from 5 stars is option for fried dumplings. I have eaten at Yumpling before, and on this freezing day I ordered shrimp and veggie dumplings. Imagine my disappointment when I cut into each "veggie" dumpling and saw pieces of meat. Luckily I eat meat, so I dealt with it. But what if I didn't? I would have to either chuck the food and lose the $ or go back out into the 10 degree weather to have it corrected. Either way is bad business. They need a better system to differentiate the dumplins. Maybe different types of dough (spinach dough for the veggie dumplin for example). Although I like this truck, I don't consider it a favorite. I agree with other reviews about the quality of the dumplings, but I don't really care because I consider dumplings essentially just a conduit for sauce anyway. And Yumpling has really good dipping sauces - I get the lemon-lime soy and the chili oil. I do think this truck is overpriced for what you get, but on the other hand, the 10 dumpling/edamame combo is one of the few food truck meals I've had that I feel is healthy but satisfying. After reading so many negative reviews, I wasn't really expecting much, so I was pleasantly surprised. They were fast - From the time I ordered, to the time I had my food was maybe 2 minutes (granted, I showed up at 1:30 on a day where there were at least 7 trucks in an area that normally has 2 or 3). Right portion size and price - 10 dumplings is definitely enough food for me. Not too little where I'll need a snack later in the day, and not so much that I have enough left overs (that probably won't keep) for the next week. And the price point for 10 seems fair to me (about the same as I'd spend on a sandwich or salad in the area). The filling amount for the dumplings was pretty inconsistent. They tasted fine. Nothing especially crave-worthy, but fine if I just need something quick other than a sandwich. The red chili dipping sauce, even though it said "spicy" next to it, was't especially spicy at all. These definitely need flavoring, so that was kind of a bummer for me. The lime soy one was OK.
As other have mentioned, it's hard to tell the dumplings apart. Both of the dumplings I tried definitely look like they had meat in them. There was one that I'm pretty sure was chicken, and the other looked like maybe it had bits of ground beef? So either the veggie one has vegetable protein or soy something (which they should probably warn people about), or maybe they got my order wrong. TL;DR: It's an OK truck if you don't have your heart set on something specific. Most of these other negative reviews must simply be untrue. 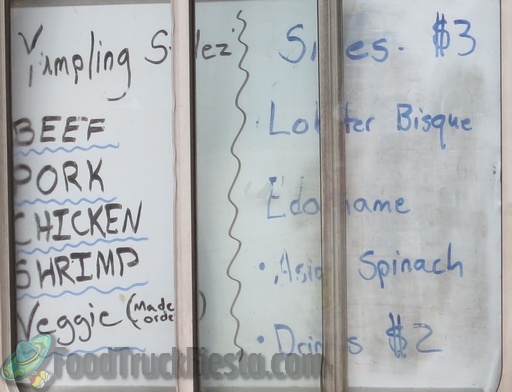 There is no way that my numerous experiences eating at this food truck could be so significantly different than these people who are obviously just haters -- due to the fact that Yumpling makes some of the most delicious homemade dumplings. Their lobster bisque was surprisingly really excellent too! Sure you've heard it before. The absolute best dumplings I've had in years. Texture of the dough was thin and silky. Fillings were big on flavor and texture. Please don't change a thing about your yummy dumplings. Can't waitn to go back to try different fillings. I must have been crazy to walk 2 1/2 blocks in the heat today, but definitely well worth the trek! The guys who operate the truck are very friendly and accommodating but $10 for this meal is not justified. I could not tell one dumpling type from another and they did not have much filling in them. The salad was very small. The sauces were very tasty, though. The food was good, but I honestly could not tell if the veggie dumplings that I ordered had meat in them (or if not, what kind of veggies they were). The food was good, but I honestly could not tell if the veggie dumplings that I ordered had meat in them (or if not, what kind of veggies they were). I had one and threw the rest out. The containers should be labeled! 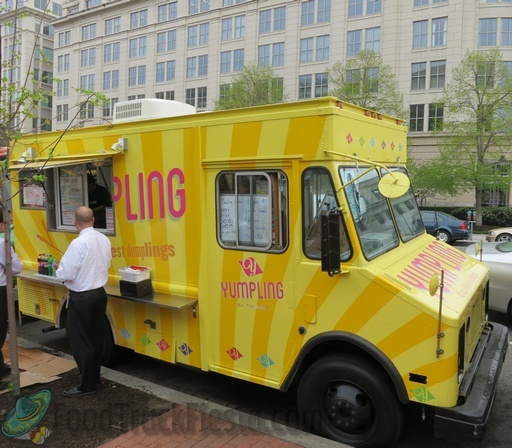 Yumpling makes authentic homemade middle eastern dumplings as well as an assortment of Asian dumplings and Spanish American-influenced dumplings, including nacho cheese dumplings. They will serve in the District, with future plans to serve Arlington and Fairfax.